The Michael Kors Access Runway is powered by a Qualcomm Snapdragon Wear 2100 chipset, with 4GB of storage thrown in for good measure. That's the same hardware configuration as the Michael Kors Access Sofie, and you'd be right to think that the interface and speed is very similar. Swiping through Wear OS is reasonably speedy with the majority of apps opening up at just the pace you'd want them to. There are only very rare moments of slowdown and they're hardly intrusive. 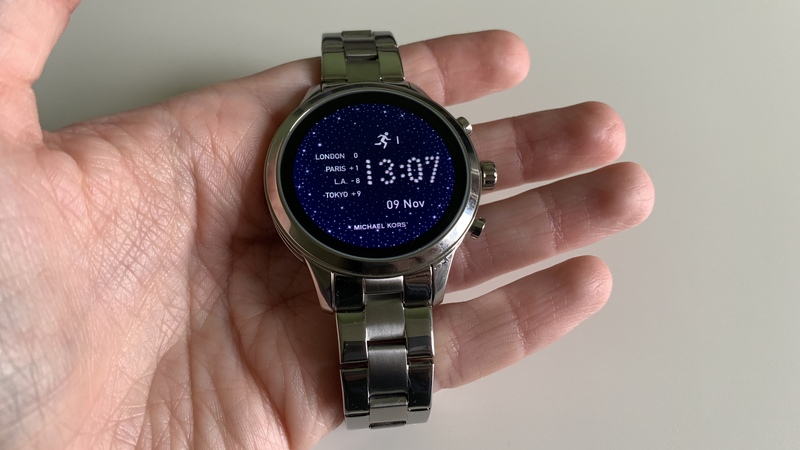 There's the usual selection of features you'd expect from Wear OS, such as pre-installed watch faces, Google Assistant voice controls, and music playback controls. It's all solidly dependable if unexceptional. There's also the return of the Michael Kors Access app. 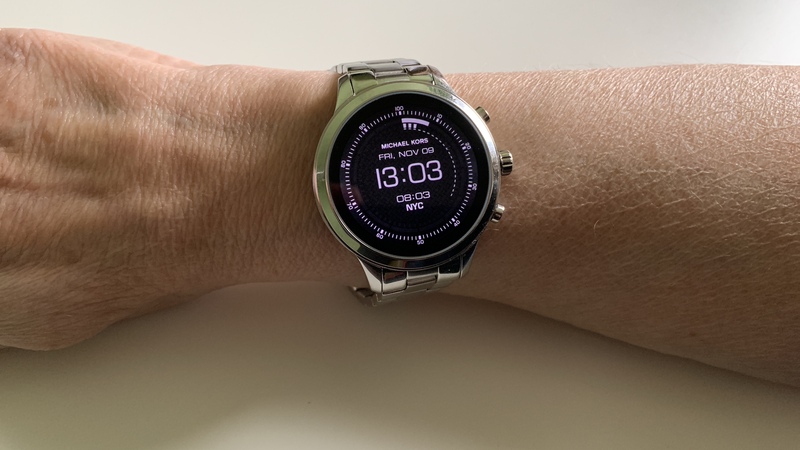 As before, it adds features like the ability to switch to your favorite watch face at different times of day, thereby enabling you to have a 'work' look and a 'downtime' look. 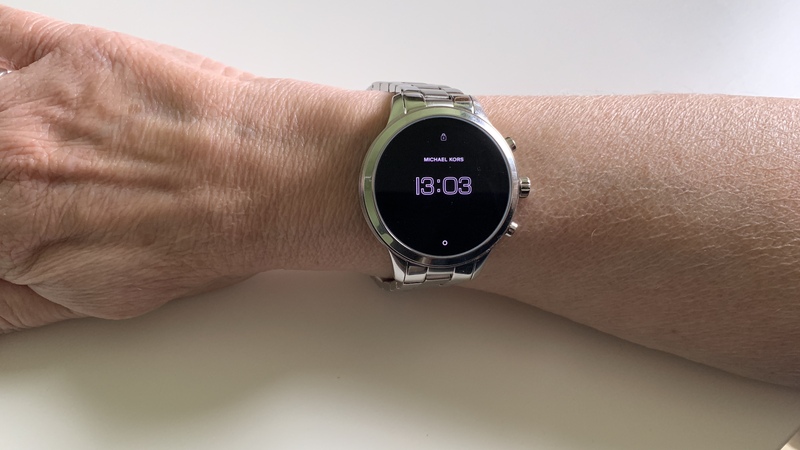 Plus, there's the ability to set up a small countdown timer, or to change your watch face to a photo from your Instagram or Facebook account. This might sound suspiciously samey and like you're merely paying for a visual update, but the Access Runway does have some very key tricks up its sleeve. Namely, it adds almost everything notable that the Access Sofie lacked. The Access Runway is the first of this generation of Michael Kors watches to offer built-in GPS, heart rate tracking, and NFC. 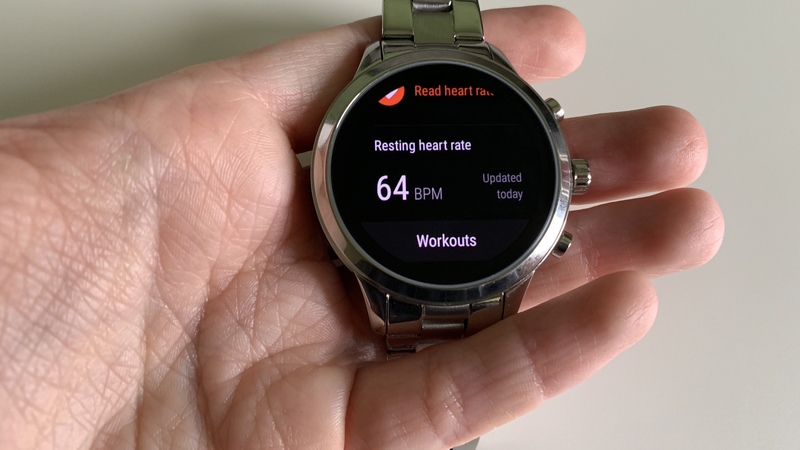 The watch takes your heart rate every 20 minutes or on demand if you choose to press the bottom button when in Google Fit. It's straightforward enough and reasonably accurate for a wrist-based wearable too. Bear in mind, it occasionally reports slightly higher readings than other devices though. There's also the bonus of built-in GPS, so you can leave your smartphone at home while walking or jogging. 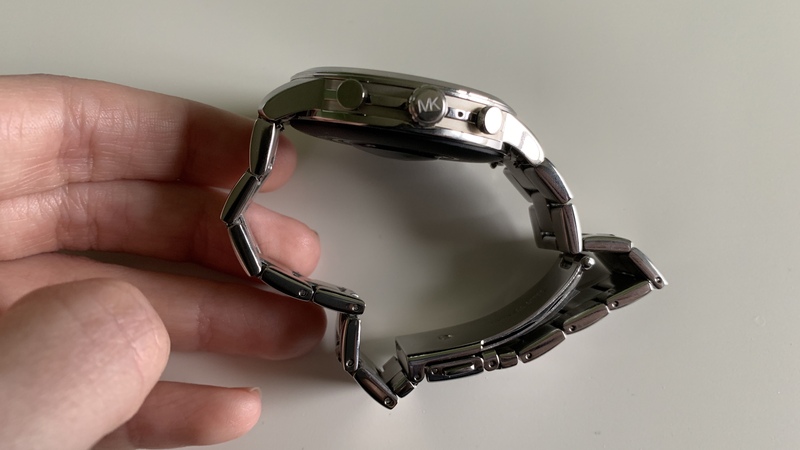 There's a knock on effect with battery life, but it's a neat bonus on a watch that's primarily aimed at the fashion market. The addition of Google Pay support also means you won't have to worry about carrying cash or cards when out and about. 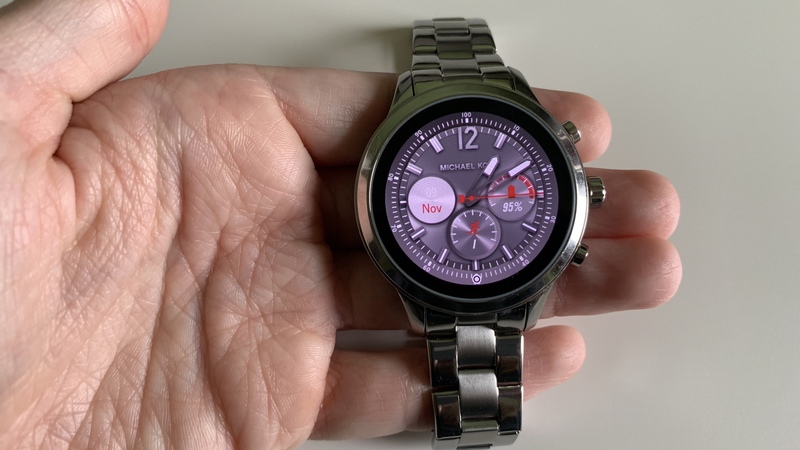 As is customary for a Wear OS smartwatch, you'll still benefit the most from the Access Runway if you have an Android phone, but that's not to say that iOS owners miss out hugely. Setup for both is a breeze, but you still need to leave the Wear OS app running in the background of an iOS device to receive notifications, and there's no chance of you being able to interact with iMessage or SMS messaging through the watch when paired with an iPhone. Also, feedback from Google Fit is a little more limited than it is for Android users, so you might wish to use a separate app like Strava or Runkeeper to get the full benefits of your workouts. However, this is a typical thing to note for any Wear OS smartwatch so it isn't exclusive to the Access Runway, nor is it the end of the world. For the most part, iOS owners will still be happy. Google Assistant is consistently eager to speed up your day, keen to listen out for you speaking "Ok Google" to get it started. It's a handy shortcut for when you don't want to have to tap around on the small screen of the watch. Google apps like Gmail allow for replies right from your wrist for both iOS and Android owners, and there's support for both Apple Calendar and Google Calendar. In all cases, notifications invoke a light vibration which is just enough to capture your attention without alarming you. And then there's Google Pay, which genuinely takes moments to set up and works whether your watch is paired to an Android or iOS device. It's pretty seamless and a huge advantage for when you don't want to have to carry around too many things. Looks-wise, the Michael Kors Access Runway isn't really made for fitness. It looks too fashionable and solid to be the kind of thing that you'd feel comfortable wearing while running or performing a strength workout. 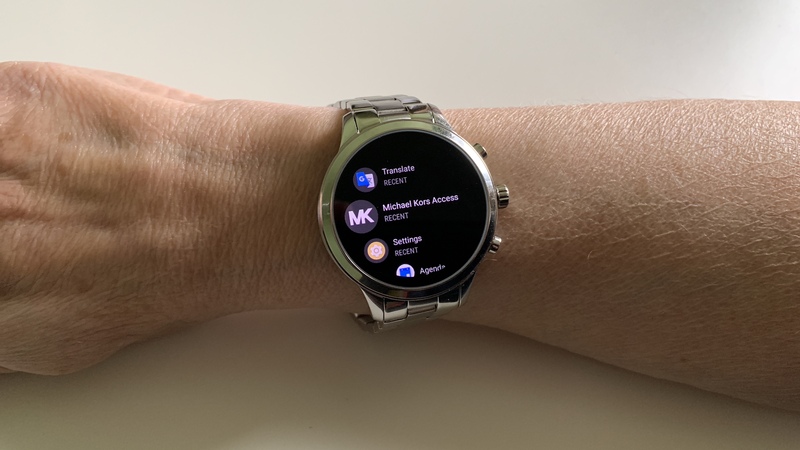 However, that option is much more likely to become reality now than with previous Michael Kors smartwatches, thanks to the Runway's built-in GPS, heart rate monitoring, and enhanced water resistance. It's not perfect admittedly, but it's a huge step for a fashion smartwatch. The heart rate monitor tracks readings every 20 minutes or whenever you manually activate a check, and its readings are pretty accurate. 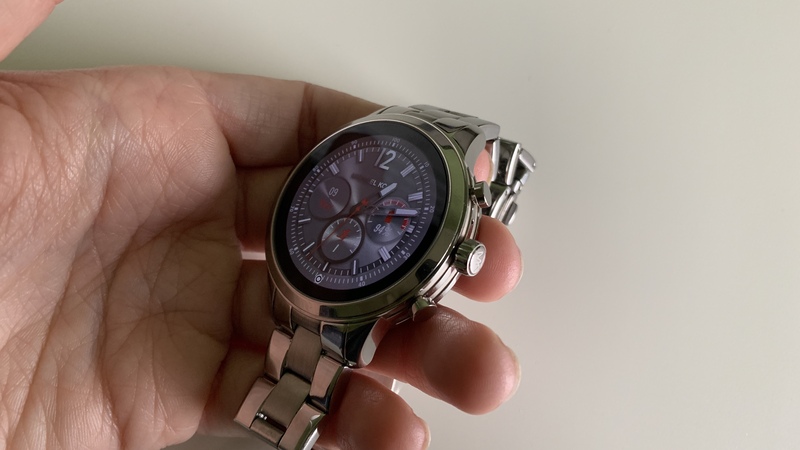 As noted above, they're a little high compared to a dedicated solution like the Fitbit Versa but they're on a par with other fashion smartwatches, and more than adequate enough for casual users. It's a similar story for the built-in GPS, which can't compare with a dedicated running watch like one of Garmin's offerings, but is more than good enough for everyday use. The waterproofing is similarly competent, although we're a little baffled as to who would actively swim while using one of the metallic straps. This is certainly where a silicone strap would come into its own. All fitness tracking is conducted predominantly via Google Fit, with third-party fitness apps also available. Google Fit uses Move Minutes and Heart Points to track how you perform. Move Minutes are active minutes of physical activity while Heart Points keep an eye on how intensively you're performing. Essentially, more is good. There's also room for typical statistics like step data, calories burned, distance covered, and heart rate measurements. A workouts option makes it possible to manually track workouts too, ranging from boxing and CrossFit to gardening or yoga. 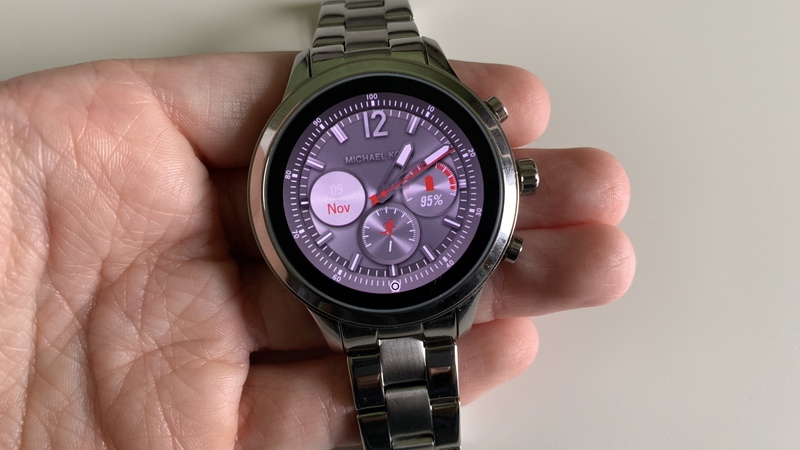 The Michael Kors Access Runway clearly isn't designed to be a fitness watch, but if you're considering dabbling a little in tracking your workouts, its features are far more useful than any Michael Kors smartwatch before it. There's not much difference between the Michael Kors Access Runway's battery and the Access Sofie's battery before it. It uses a 300mAh battery like before with a battery life estimate of about one day. That's a little optimistic given the extra features that the Runway offers. If you regularly use the built-in GPS and frequently hit the heart rate monitor button, you're going to see a slight dip. For the most part it lasted a waking day, but expect to charge this watch up every night if you use it a reasonable amount throughout the day. As before, charging the Michael Kors Access Sofie is easy enough. You place its magnetic charging puck underneath the watch body and leave it to it. There's hardly any risk of it falling off, so it's the perfect setup for leaving the Runway overnight or for when you want to top it up throughout the day. 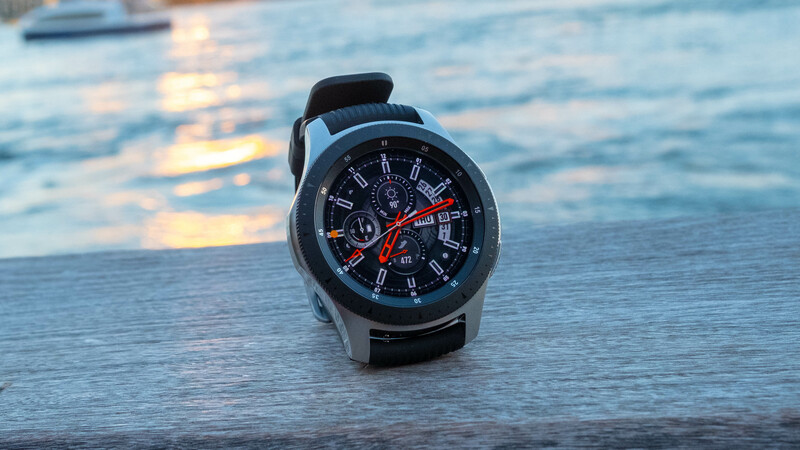 A battery life of just under a day is starting to look a little stale now though, when competitors like the Samsung Galaxy Watch are achieving several days. Even the Apple Watch 4 is better than the Access Runway right now. The Michael Kors Access Runway is a smart, fashionable smartwatch that also offers some useful features. It's not entirely practical to use when working out, but its features - such as GPS and a heart rate monitor - mean that it's certainly now an option. As a general all-rounder, it's an eye-catchingly pleasant option for those in need of a glamorous smartwatch. Aimed at those who want to look good but not at the expense of useful features, the Michael Kors Access Runway is a classier smartwatch than its predecessor - the Michael Kors Access Sofie. It's a little more understated and elegant, and is sure to blend in nicely with whatever you're wearing alongside it. It's not so subtle that it won't draw attention on a smart night out, but it's still the kind of timepiece that you could wear on a daily basis without feeling too decadent. The inclusion of built-in GPS, heart rate monitoring and NFC isn't before time, and it ensures that the Access Runway is a watch that will keep you happy on brief workouts as well as a night out. Just don't expect to swim with it often. It's a little too chunky to feel comfortable for anything too strenuous. The Michael Kors Access Runway is an undeniably attractive watch. Suitably expensive in both look and feel, it's an ideal fashion accessory for most women. 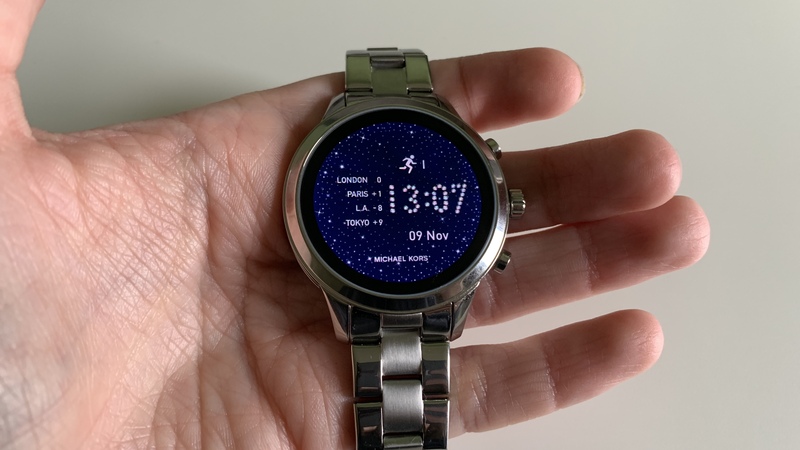 The addition of Google Pay, heart rate tracking, and GPS means this is a reasonably practical watch too, even if it's not quite as durable or fitness-focused as something like an Apple Watch. 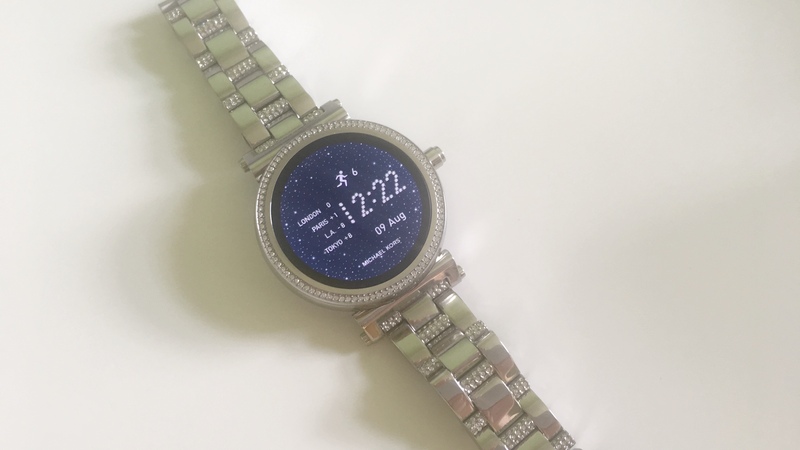 Its battery life is a little lacking compared to some other smartwatches on the market, but if you don't mind charging it each night, it's a bit of a success story. It's just that good-looking. 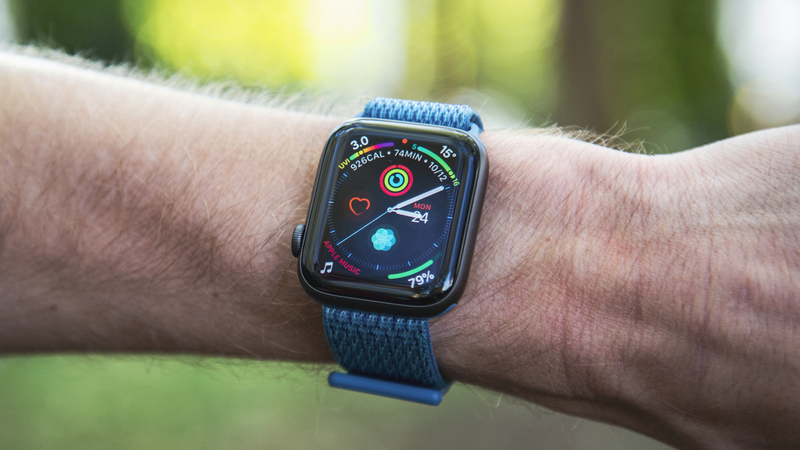 The Apple Watch 4 is the practical smartwatch option for iOS owners. It's undeniably more feature-packed than the Michael Kors Access Runway and its app choice is far better. Notably, battery life is far better too, and it's lighter to wear, making it ideal for fitness purposes. Does it look anywhere near as nice? Well, no, and that's going to be a deal breaker for some. The Samsung Galaxy Watch is probably the best smartwatch out there, providing you're not too fussed about its looks. Its interface is slick and speedy, and a rotating bezel is a useful feature to have. Most impressively, a four day battery life means you won't be constantly recharging it. However, its design is chunky and sure to be too big for some, particularly those with small wrists. It won't grab people's attention in the way that something as classy looking as the Access Runway will. Perhaps the most direct comparison, the Michael Kors Access Sofie is just like the Access Runway but nowhere near as good. The Access Runway offers the better features, and the slightly more attractive watch strap choices. It's also a little lighter and fits more attractively on one's wrist. The Access Sofie is showing its age with its lack of features now, despite that premium look.